This week I attended the Brit Milah of the grandson of friends that took place in one of the oldest original synagogues of Tzfat, the Beit Knesset Rabbi Yosef Bannai, also called HaTzaddik haLavan, the White Zaddik. 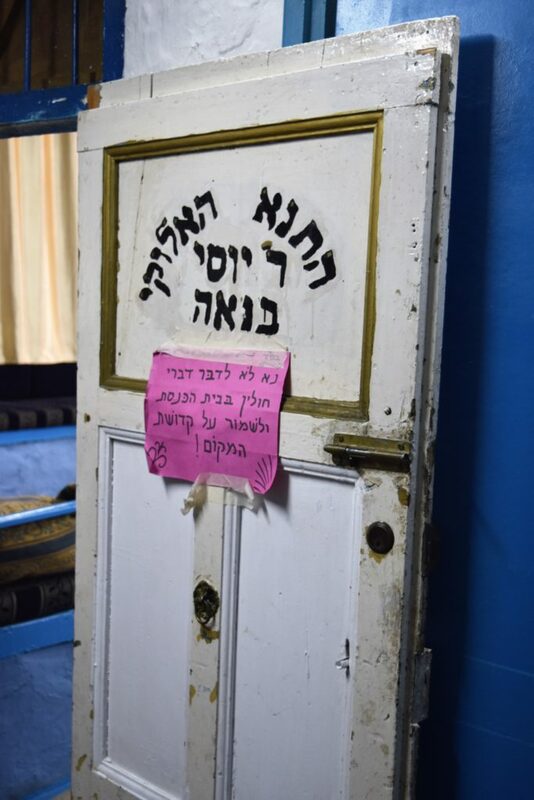 Rabbi Yosef Bannai, whose name means “the builder,” was a Tanna of the time of Rabbi Meir, and the synagogue is built over his grave – a bit unusual. The some of the great rabbinic leaders and kabbalists of the sixteenth century attended this synagogue, and it survived the devastating earthquakes of 1759 and 1837 intact. The Shababo family have been the caretakers of the Beit HaKnesset for over four hundred years, generation after generation, a warm and friendly family, and one of their sons is the father of the child. This Kehillah is suffused with Torah tradition and Torah spirit of the Land of Israel. 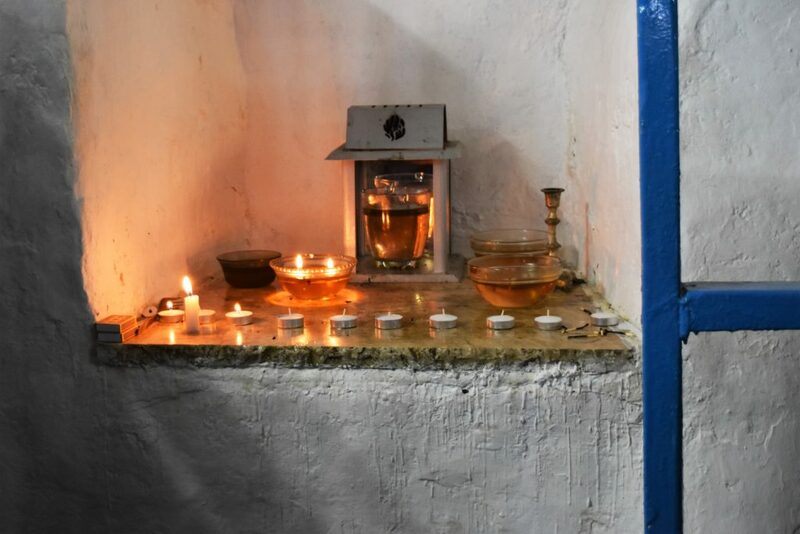 They have certain customs that are unique, including an ancient chant for the cantillation signs for reading the Torah, differing from the Diaspora communities of the Middle East, Europe and North Africa. The Brit Milah ceremony began with spirited singing, and the Mohel performed the mitzvah with a mindful and graceful sure-handedness in total flow with the spirit that swept everyone up. And you: take for yourself the best spices, pure myrrh five hundred shekels, sweet cinnamon half as much, two hundred and fifty shekels, sweet calamus two hundred and fifty. אמר רבי חייא …ואתה קח לך בשמים ראש מר דרור, אלא כלא ברזא עלאה איהו לאכללא שכינתא בהדיה,… אמר רבי יצחק נהורא עלאה ונהורא תתאה כליל כחדא אקרי ואתה כמה דאת אמר (נחמיה ט) ואתה מחיה את כלם… רבי שמעון… אמר, ואתה הקרב אליך ליחדא בהדיה ולקרבא בהדיה רזא דשמא קדישא כדקא יאות, ואתה תדבר אל כל חכמי לב, בגין דכלהו לא אתיין למעבד עבידתא עד דרוח קדשא ממללא בגווייהו ולחש לון בלחישו וכדין עבדי עבידתא, ואתה תצוה את בני ישראל, רוח קדשא פקדא עלייהו ואנהיר עלייהו למעבד עובדא ברעותא שלים, ואתה קח לך כמה דאוקימנא ואתה הקרב אליך, והני כלהו הכא בעובדא דמשכנא, דכלא אתעביד ברזא דא. Rabbi Hiyya said: … “And you: take for yourself the best spices…” all [occurrences of the phrase “and you”] refer to a supernal secret, to include the divine Presence with [Moshe]. These three sages of the Zohar differ over what technical kabbalistic aspect or aspects of divine revelation are alluded to in the phrase “and you.” But they are in general agreement that the phrase “and you” means that in the project of building the Mishkan Moshe and the craftspeople did not just build on their own initiative. “And you” implies additional presence – divine Presence. Moshe gave directions in a state of union with the Shekhinah, and the wise craftsmen and craftswomen sensed the direct communication and infusion of holy spirit, and only then did they engage in the work. And you: keep My covenant, you and your offspring after you for their generations. The phrase “and you” here should signify that Avraham performed the Mitzvah action of Brit Milah in unification with the Holy One, blessed be He, and the Shekhinah, His Presence – the reality of God together with consciousness of God. This is confirmed by the midrashic tradition, and it turns out to be absolutely necessary in order for Avraham to fulfill the Mitzvah of Brit Milah in the first place, to begin the chain of generations of his offspring who will perform this mitzvah as well. Rabbi Yosef Rosen, the Rogachover Gaon, in his Tzafnat Paneach, asks a sharp question. He notes that the halakhah is that the mitzvah of Brit Milah must be performed by an Israelite. In the case of a convert, it’s done by a Mohel on the authority of the court that is overseeing the conversion. If so, asks Rabbi Rosen, how could Avraham, who was still a Noachite, perform Brit Milah on himself as a mitzvah? Until he is circumcised he is not yet in the category of Israelite, in the sense of being the in category of someone who can perform the mitzvah of Brit Milah. But the only way to get into that category is be circumcised by someone in that category, which he cannot do to himself because he is not in that category. It’s a Catch-22 based on the restrictions of the linear sequence of events. The question is how to bootstrap the system of circumcision for the very first time – and until that’s done, there can be no chain of tradition of Brit Milah for succeeding generations of Israelites. And Avraham was ninety-nine years old when he was circumcised. [Avraham] said before [God]: “who will circumcise me?” God said “you yourself.” Immediately, Avraham took the knife and was about to cut when he became frightened because he was elderly. What did the Holy One, blessed be He, do? He sent forth His Hand and took hold with him and Avraham was able to cut, as it says … “He established the covenant with him (Nehemiah 9),” teaching that the Holy One, blessed be He, was holding him. Clever. But it’s more than clever. Right up front, in the verse in which God calls to Avraham saying “And you: keep My covenant,” God promises that He will perform the Mitzvah with Avraham, inspiring and embracing him in His holy Presence. And this promise extends from this mitzvah to all mitzvot. The prohibition of idolatry extends to thought and imagination as well. Any image or idea or thought-form we might have of God is, by definition, not God. The Torah calls us, God calls us to be in direct relationship with God, without images or thought-forms. יסוד היסודות ועמוד החכמות לידע שיש שם מצוי ראשון, והוא ממציא כל נמצא, וכל הנמצאים משמים וארץ ומה שביניהם לא נמצאו אלא מאמתת המצאו. The foundation of foundations and the pillar of wisdoms is to know that there is a First Existent, and He brought into existence every existent, and all existents from heaven and earth and what is between them do not exist except from the reality of His being existent. In all your ways know Him, and He will straighten your paths. Through our full being, in all our ways, we are called to realize we are being held effortlessly in existence – and we are not doing the holding. In this way, without projecting any ideas or images, we sense God’s Presence through ourselves, feeling the embrace and empowerment of the One Who has created us to be who we are, to express His Will through our beneficial involvement in the world. This is what the life of Torah and Mitzvot is about, and there are times when it comes together clearly, when we can sense HaShem’s Presence among good-hearted people gathered for a precious mitzvah, supporting and encouraging each other to celebrate the arrival of another Jewish soul bringing more of His infinite light into the world.